My Blog: A Tweet Etsy Team Shoppe - Herban Lifestyle! Etsy Twitter Team and what a warm, wonderful group they are, too! Today, I want to introduce you to Mary of HerbanLifestyle! Here's a woman after my own heart! She walks the walk and to me that reflects a spirit that is as fluid as water! 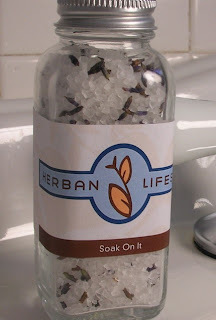 Mary, a wellness consultant and Reiki practitioner, has developed her own line of new herbal bath and body products - with that FABULOUS name, Herban Lifestyle! What first struck me about Herban Lifestyle, is Mary's dedication to using high quality, organic ingredients; along with her earth friendly packaging... it has such a clean and fresh look that I just adore. Secondly, her prices are WONDERFUL! The Soak on it Bath Salts (above) contains yummy smelling bath salts along with lavender, to give your soak that calm that we all need at the end of our busy days. Tell me, where else can you get smooth, moist lips while indulging yourself with the scent of Chocolate Peppermint? Well at Herbal Lifestyle! Check out this CALORIE FREE way of having your Chocolate Mint, while having your lips as kissable as Angelina - and get this... the price is ONLY $5.00! Herban Lifestyle also has gift packs and check out this wonderful grouping (above) - It's the Herban Lifestyle Organic Baby Gift Set! Wonderful way to tell that New Mommy that we care both about her and her little one! Let me say just one more thing about that Mary! 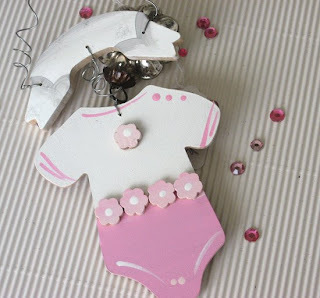 She wanted me to promote my Onsey of a Kind Ornament/Personalized tag along with her baby grouping. 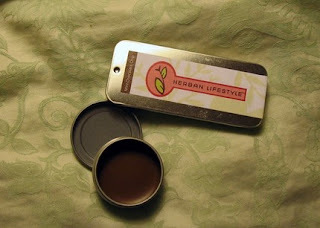 Please, Check out Herban Lifestyle at her Etsy Shoppe. But don't stop there... She has an informative Blog where you can learn the in's and out's of great care for both our bodies and souls. Thank you so much for this wonderful post, Nancy! I appreciate your support. Welcome to the Etsy Twitter team!